Good Tasting Variety, Boiling, Baking. Good for Chipping. 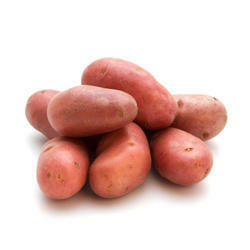 We are into providing an excellent quality range of Red Potato. We are ranked on top by offering the best quality of Lady Rosetta Potato, which is known for its remarkable finish and quality. Utilization:Good tasting variety, Boiling, Baking and good for Chipping. Yield:High yielding variety of attractive appearance, very uniform in size, rather susceptible to internal bruising , Short dormancy period, very high dry matter. Primary use:Boiling, Baking and Chipping. Availability (Harvest Period ): January Ending to March. With sincerity and hard work of our professionals, we have carved a niche for ourselves in this domain by providing a premium quality gamut of Red Potato. Utilization : Good Tasting variety, Boiling, Baking and good for Chipping. Yeild : High yielding variety of attractive appearance, very uniform in size; rather susceptible to internal bruising. Short dormancy period; very high dry matter. Primary Use : Boiling, Baking and Chipping. Potato is a starchy root vegetable of Central American origin. This humble tuber is one of the most widely grown crops and one of the cheapest staple food items eaten by population all-over the world. Botanically, it belongs to the various perennial subspecies of Solanum tuberosum, in the Solanaceae family. Utilization: This potatoes are excellent for chipping and fresh frying. 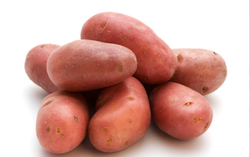 We are able to supply a qualitative range of Red Potato. S.P. Chips Potato Pvt. Ltd.
Our firm is ranked amongst the reputed names in the market for offering an extensive range of Lady Rosetta Potatoes. We are amongst the most reputed names in the industry, offering Red Potatoes. LR Potatoes (Lady Rosetta) which are normally used in making wafers and french fries. Comprehending the varied desires of our clients, we are instrumental in presenting a comprehensive range of Lady Rosetta Potato. Aone Daily Fresh Pvt. Ltd.